I am very happy to welcome Sean Pagaduan our blog. I want to take this opportunity to thank him very much for sharing his experiences and insights about the MFA Program offered at New York University. NICHE: Tell us a little bit about your personal journey to the MFA. SEAN PAGADUAN: I had graduated from the University of Arizona with a BSBA in Business Economics and a minor in Creative Writing, with a focus in fiction. It turns out that a BSBA is not enough to get by in today’s job market. I ended up applying partially because I wanted to continue working on my writing, but also partially because I’m interested in teaching creative writing. Of the schools I was accepted to, I felt like NYU would work best with my aesthetic, and that the experience I would gain from living in New York City would be invaluable. NICHE: Tell us a little bit about the funding offered for NYU students. Is funding competitive? SEAN PAGADUAN: NYU’s official tuition is roughly $20k per year, but every student is offered a $10k remission. Some students are offered full remission and additional stipends. Some students also have the opportunity to apply for a teaching position with the NYU Veterans Writing Workshop (full tuition remission plus $12k stipend). I also have a couple friends who work as Starworks fellows in working with hospitalized children (another tuition remission plus $12k stipend). Furthermore, NYU guarantees an undergraduate teaching position in the second year ($5k per class, so that would be a 1/0 or 0/1 workload). The funding seems to have ballooned since 2008, and I think that it’s slowly registering with MFA applicants that NYU does have money to give away. NICHE: Does NYU encourage their students to send their work out for publication? SEAN PAGADUAN: I don’t think I’ve been actively encouraged to send out work for publication. I do know that the professors here pay a lot of attention to the writing market and can tell you whether they expect a given piece to succeed. I also know that NYU is pretty active in bringing literary agents by. In a couple weeks, we’re going to have an agent talk to a Craft of Fiction class for an hour or two about what agents look for in a manuscript and how to find an agent. Plus, NYU will have agents coming by in late March for second year students to pitch whatever they’re working on. So, while they don’t go out of their way to tell you, Hey, you should really really submit this, they do make a lot of resources available. NICHE: What authors have you had the opportunity to work with? SEAN PAGADUAN: So far, E.L. Doctorow, Irini Spanidou, Brian Morton, and Chuck Wachtel. I’ve also attended a master class by Lydia Davis. Lorrie Moore was NYU’s big catch to teach a craft class and a workshop this spring, and I’ve heard rumors that we’re going to have someone big next year coming by for a semester, but because it’s unconfirmed, I’m not sure if I should let the cat out of the bag just yet. But she’s a big name. I will kill to get into her class. NICHE: How are the workshops at NYU structured? Would you call the workshop environment supportive? SEAN PAGADUAN: There isn’t really a typical workshop structure here. My class with Irini had one or two students leading discussion, and then the whole class just more or less went at it. My class with Chuck, on the other hand, is far more structured. His workshop is separated into three parts: Part One is mostly praise and a discussion of what elements of the story were working; Part Two is a discussion of what was unclear in the piece and suggestions for revision; Part Three is the author asking any questions she may have brought to workshop. Irini did not typically let students talk during their own workshop, but Chuck typically does. So, very different workshop styles. That said, both workshops I’ve been in have been very supportive. NICHE: Are there any downsides to the program? SEAN PAGADUAN: I wouldn’t say that these are downsides so much as caveats. The first is that NYU is not one contiguous campus, so you really don’t get a lot of the school community that you would at a different kind of campus. The second is that NYU’s program is much larger than other programs. Last year, NYU admitted somewhere around 20-30 students for fiction, which, combined with the 20-30 from the previous year and the 5 or so third years, means that you definitely will not be close with every single person there (even though I’m guessing most writers become close friends with a half dozen people or so). NICHE: How do you like living in New York? Upsides? Downsides? SEAN PAGADUAN: So I come from Phoenix, AZ, and living in a place that has excellent public transportation, a smart city planner, museums (some of which, by the way, NYU students can get in free with their student IDs), good food, and an amazing library system is something of a godsend. Downsides include the inability to actually see stars at night, horrible Mexican and Tex-Mex, and the cost of living. NICHE: What advice would you give for prospective MFA candidates? SEAN PAGADUAN: Throughout the course of the program (or in undergraduate workshops), you’ll end up running into maybe two or three readers whose comments always scare you. These readers may be your close friends, they may just be random people, they may be lazy with everyone else’s stuff, and they may have a different aesthetic slant than you. But if they’re consistently scaring you, they’re the readers to pay attention to. 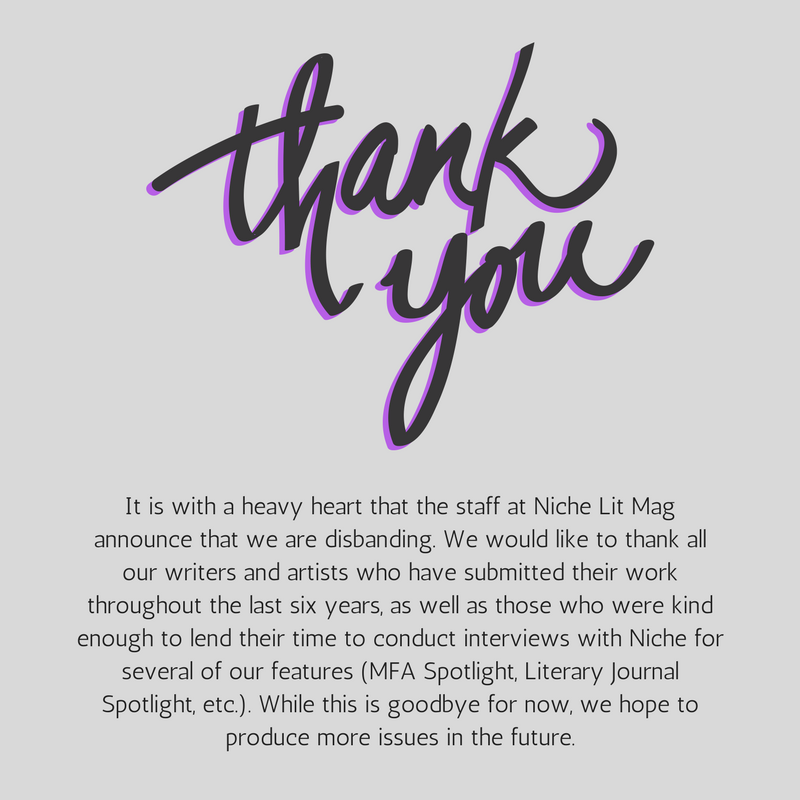 This MFA Spotlight was originally published on Niche’s website on March 27th, 2013. Next Our Origins: Why is Niche here?